Research led by scientists at the University of Bristol and NHS Blood and Transplant, used stem cells from adult and umbilical cord blood to create a small volume of manufactured red blood cells. 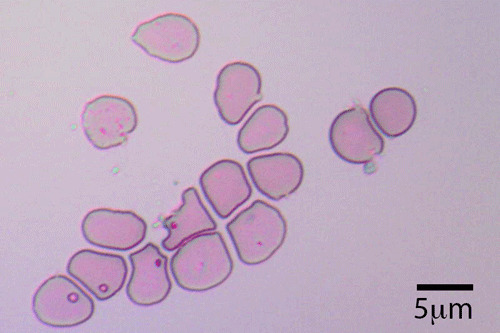 It is hoped that when the production of this lab-produced blood is successfully scaled up, it will offer an alternative to specialist patients with blood disorders such as sickle cell anaemia and thalassemia who require treatment with regular transfusions and for whom it is difficult to find compatible donors. Blood cells grown in culture (reticulocytes). Courtesy of the University of Bristol. The clinical trial of manufactured red blood cells is designed to compare the survival of red cells manufactured from stem cells with that of standard blood donor red blood cells. This will involve a group of 20 volunteers who will receive a small volume transfusion of between five and ten mls of the lab-produced blood. Dr Nick Watkins, NHS Blood and Transplant Assistant Director of Research and Development, said: “Scientists across the globe have been investigating for a number of years how to manufacture red blood cells to offer an alternative to donated blood to treat patients. We are confident that by 2017 our team will be ready to carry out the first early phase clinical trials in human volunteers. “These trials will compare manufactured cells with donated blood. The intention is not to replace blood donation but provide specialist treatment for specific patient groups. NHS Blood and Transplant has already set ambitious targets for organ and blood donation. The 2020 research and development plan focuses investment in experimental medicine to support these. The National Institute for Health Research (NIHR) has committed £12.1 million funding for three NIHR Blood and Transplant Research Units. The NIHR Blood and Transplant Research Units will be embedded within a top university, and, in partnership with NHS Blood and Transplant, will focus on rapid translation of research findings into routine practice in blood donation and in transplantation of stem cells and organs. A decision regarding a possible fourth NIHR Blood and Transplant Research Unit is expected soon. The landmark in-man clinical trials of manufactured blood form a key part of the blood and organ service’s 2020 Research and Development programme, and are set to be transfused into humans by 2017.